You wouldn’t know it from visiting the Team Broken Earth website, but Dr. Andrew Furey is the reason the special non-profit initiative exists. 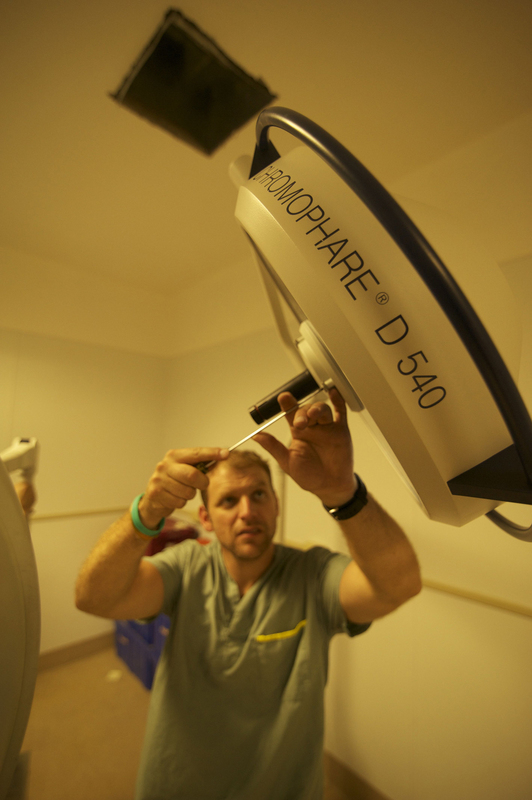 An orthopedic trauma surgeon, Andrew felt compelled to offer his services when the 7 Mw earthquake hit Haiti in January 2010, killing more than 200,000 people, and displacing and severely injuring many more. In June of that year, he formed a team of three—himself, wife and pediatric emergency room doctor Allison Furey, and orthopedic surgeon Will Moores—and together they travelled from St. John’s, Newfoundland to Port-au-Prince, Haiti, where they spent a week volunteering to help fix some of what was broken. After returning from that first mission, Andrew founded Team Broken Earth, a volunteer task force of Canadian physicians, nurses and physiotherapists committed to providing aid in Haiti. Since its inception, the organization has carried out nine missions to Port-au-Prince, with the next one scheduled for October 2013. Broken Earth has expanded to include teams from Calgary, Alberta and Halifax, Nova Scotia. It has also grown in scope, looking beyond the initial devastation of the 2010 earthquake to provide ongoing medical care and help make the region more self-sufficient in the long-term. 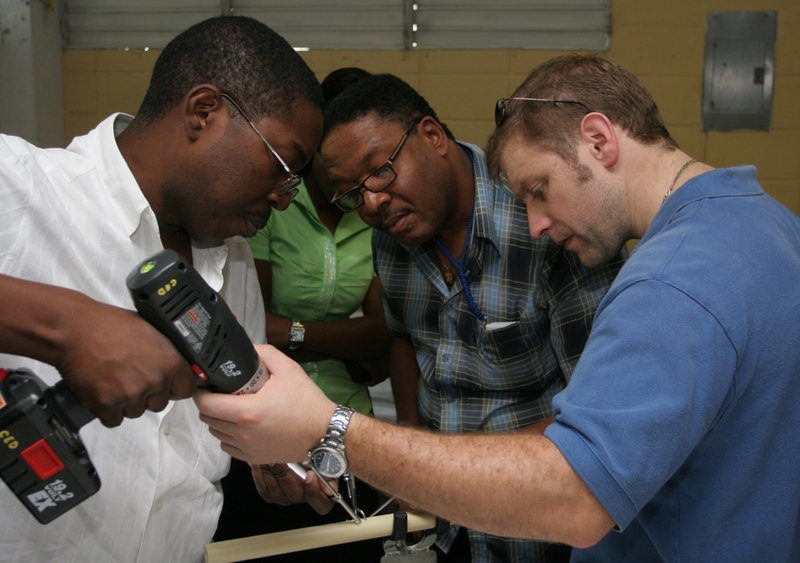 The organization offers medical training to Haitian doctors, nurses and allied healthcare workers, and is working to develop sustainable community programs in Haiti. As president of Team Broken Earth, Andrew has gone on every one of their missions, leading the medical care of more than 500 patients per week. He’s also responsible for setting the direction of Broken Earth and negotiating partnerships and sponsorships. But in spite of his pivotal role in the organization, he doesn’t take credit on its website. He’s right, of course. Broken Earth is a joint venture with Project Medishare, an initiative of the University of Miami’s medical school. The non-profit receives support from a number of sponsors, including Andrew’s alma mater, Memorial University. 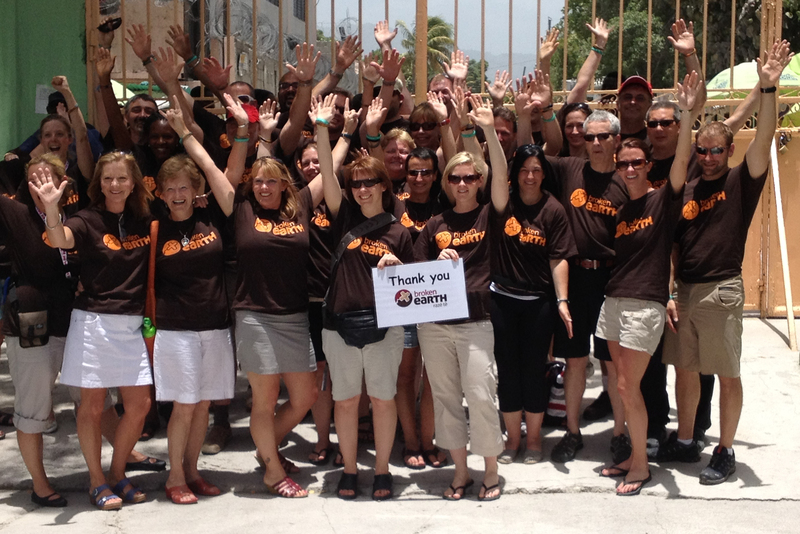 And each member of Broken Earth’s medical teams raises their own funds to travel to Haiti for the weeklong missions. But every team needs a leader. And in this case, it’s Andrew who leads Team Broken Earth to solid ground. Born and raised in St. John’s (a.k.a. The Rock), Andrew was given a great foundation from the start. His family, whom he describes as “very loving,” included two younger sisters and a younger brother, a nurse and music teacher mother, and a father whose life story “was always an inspiration for me,” says Andrew. “Spoiled” by love and a thirst for knowledge, he followed in his father’s footsteps, enrolling at Memorial University after graduating from Gonzaga High School in 1993. He completed a BSc (1997), an MD (2001) and a Masters of Clinical Epidemiology and Orthopedic Surgical Residency (2004). As he tells it, his interest in medicine stemmed from an equal passion for the science side and the clinical side of the field. Andrew completed his residency in 2006, and then accepted a one-year fellowship in Orthopedic Trauma at the University of Maryland’s R Adams Cowley Shock Trauma Center. After that, “I returned to The Rock and have been happy here ever since,” he says. Today, he lives in St. Philips, Newfoundland, where he continues to follow his father’s lead. 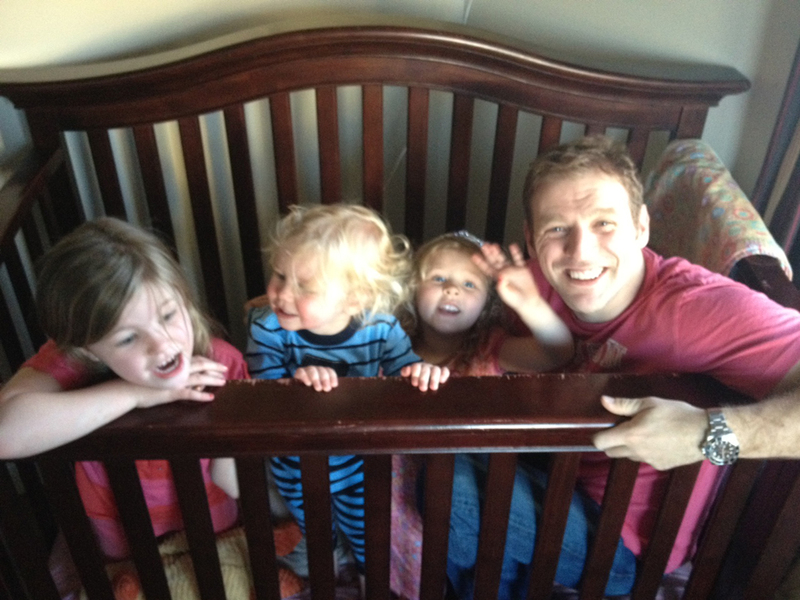 Andrew and his “superstar wife,” Allison, are “spoiling” their three children, Maggie (6), Rachael (4) and Mark (2), with a wonderful example of generosity, initiative and caring. In addition to his volunteer efforts with Team Broken Earth, Andrew keeps a number of plates in the air—each of them very full. He’s actively involved in local community initiatives, including the Torbay Tri for Health, which he launched in 2010 with his brother-in-law, Mike Rudofsky, in an effort to raise funds and awareness for mental health. 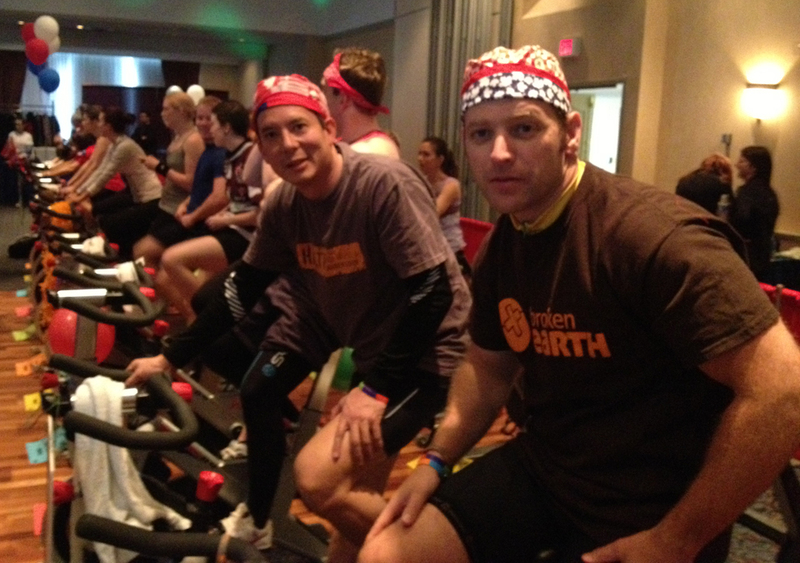 Andrew (right) with Dr. Arthur Rideout (centre) at a Spin 4 Kids fundraiser, St. John’s, N.L. 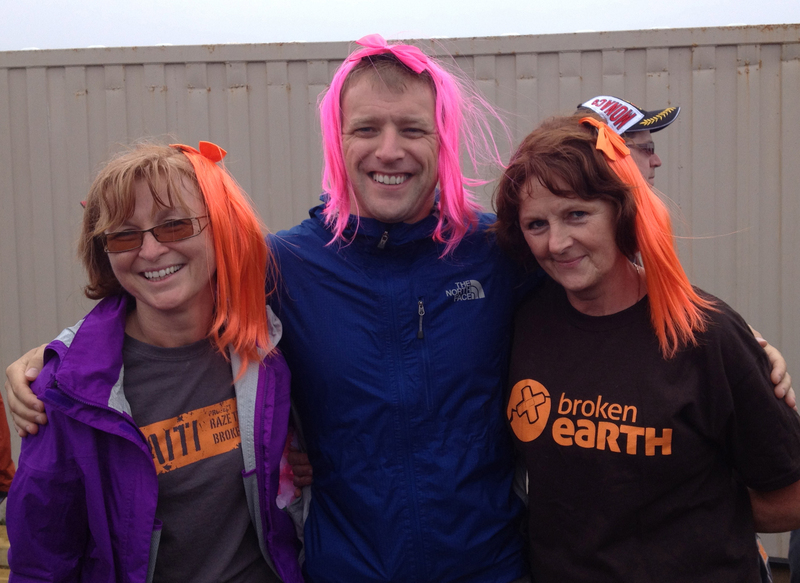 Andrew (centre) with fellow Team Broken Earth members at a rowing fundraiser for breast cancer research, St. John’s, N.L. 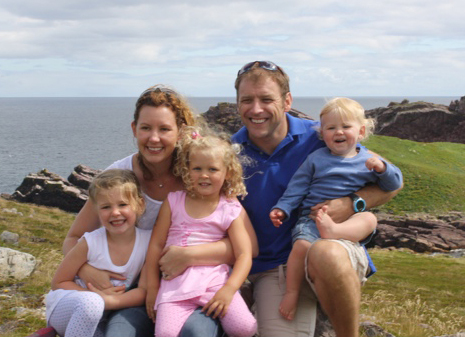 On the professional side, Andrew works as Assistant Professor of Surgery at Memorial University, and is President of the Newfoundland Orthopedic Association and Director of Research for the Orthopedic Resident Training Program at the Memorial Medical School. He also sits on multiple national committees for the Canadian Orthopaedic Association (COA). Such outstanding contributions to the local, medical and international communities haven’t gone unnoticed. His recent accolades include the 2011 Rotary Emerging Professionals Award, the 2012 Queen’s Diamond Jubilee Medal and the 2012 Memorial University Alumnus of the Year award. Still, from talking to him, it’s obvious that his greatest reward is being to draw on his expertise as an orthopedic surgeon to help heal those in need. As Andrew tells it, he was drawn to orthopedics because it offered a definitive path to recovery. That line of thinking is what brought him to Haiti in 2010. Watching real-time footage of the earthquake, he felt compelled to help. He contacted his colleagues in Baltimore, who were already offering medical aid in Port-au-Prince, and put together a team to join their relief efforts. That initial weeklong relief mission went well. But unfortunately, the Baltimore group’s makeshift medical centre, comprised largely of tents erected around fallen power lines, was eventually deemed unsafe and shut down. So when the time came to launch Team Broken Earth, he looked elsewhere for a partner. That search led him to the University of Miami’s Project Medishare. “They’d built a hospital in Haiti that relies on international teams of physicians to help staff and support its daily operation,” says Andrew. It was a perfect fit. He joined forces with Medishare, creating a vital partnership that provides the fertile ground necessary for Team Broken Earth to thrive. The notion of partnership, of forming a true team, is essential to Broken Earth’s success. As Andrew says, every member of the volunteer task force is “pushed to their professional and personal limits” on each mission. But they never reach the breaking point, and the reason is this: the team serves as a titanium crutch, there to prop everyone up when the time comes. Still, that kind of support doesn’t entirely ease the pain of losing a patient. He recalls one devastating example (and there are many; you can read more in The Globe and Mail article on Dr. Spencer McLean) from an early Broken Earth mission. It involved an 18-year-old woman who had been shot in the abdomen by a stray bullet. Working in those conditions serves as a constant reminder to Andrew of how lucky he is—how lucky we all are—to live in Canada. 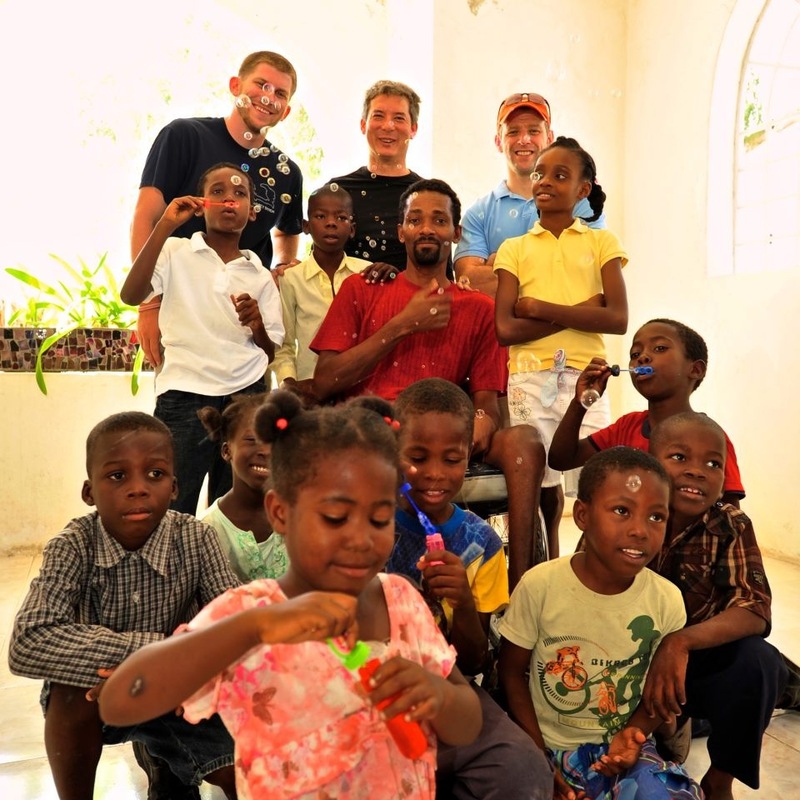 Since his first trip to Haiti in 2010, he has seen a lot of improvements in the Caribbean country. But he’s keenly aware that they’re still in need of support. For that reason, Team Broken Earth has gone beyond its initial mandate to provide medical aid, and now helps to train Haitian healthcare workers and establish sustainable community programs so the nation can become more self-sufficient. For his part, Andrew serves as Director of Orthopedic Surgery at Medishare’s Bernard Mevs Hospital in downtown Port-au-Prince and sits on the Board of Directors for Project Medishare-Haiti. He’s also involved with the Port-au-Prince education group that his Baltimore colleagues launched in 2011. Looking ahead, Team Broken Earth is working with the Haitian Orthopedic Society to try to bring Haitian healthcare workers to Memorial University for medical training. Andrew foresees a number of logistical obstacles to this next step. But he also firmly believes that it’s worth persevering, and that they’ll eventually make their vision a reality. After all, his work in Port-au-Prince is proof that determination and dedication pay off, and that the power of the human spirit is limitless. You wouldn’t think there would be any backlash to a medical mission like Broken Earth—one built on caring, generosity and a desire to give back. But Andrew has encountered a remarkable number of people looking to pick holes in their efforts. What they’re doing—what Andrew is doing—is working together to give back to others in need and make a positive difference in the world. To help our broken earth begin to heal. To get involved or donate to Team Broken Earth, visit brokenearth.ca. For their latest news, follow @TeamBrokenEarth on Twitter or ‘Like’ the organization’s Facebook page. To reach Andrew, email andrew@brokenearth.ca. Thank you to Team Broken Earth Calgary’s Kimberly Carcary for recommending Andrew as a Kickass Canadian. Andrew is a great candidate for a Kickass Canadian. There must be more then 24 hours in his days. James, I tend to agree… He’s extraordinary! 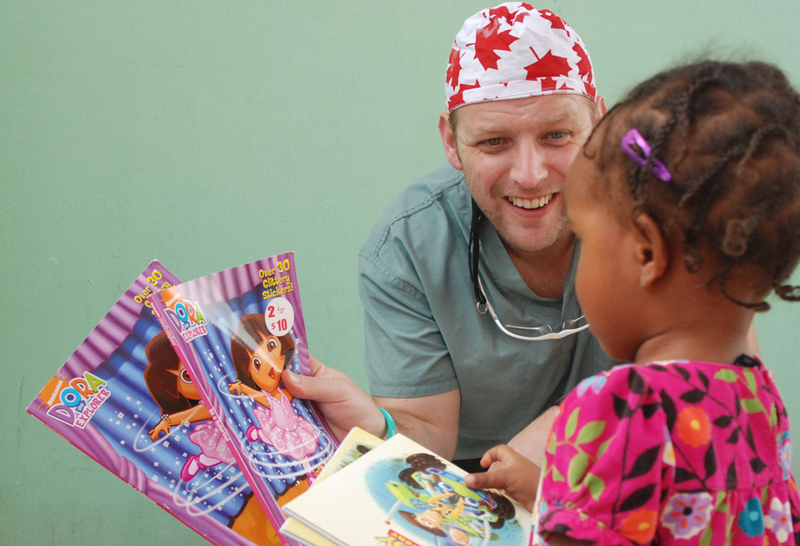 Dr. Furey has rippled his passion to so many people and countries. He is an unselfish, caring and compassionate man who has never lost sight of his profession. He is living up to his oath! We, as Canadians, must recognize and embrace such a tireless humanitarian. A job well done, Andrew… Carry on. Thank you for sharing, Maureen! Thank you so much for all of your kind words and support. It is really a kickass Canadian team effort of nurses, doctors and therapists, and it is your kind words that give us the inspiration and momentum to help those in need. Andrew Furey is one of the true heroes of my life. I applaud his humanitarian efforts and his outstanding professional talents. May God bless him and everything he touches! I always knew that Andrew would be very giving to those in need growing up. But after reading this article, I’m very privileged to have known Andrew from such a young age. Keep up the great work to all involved with Team Broken Earth. Thanks for weighing in, Robert. Andrew is a really remarkable person. It’s a privilege to know him. Glad he’s got great supporters out there! I have always said that angels roam the earth, and only a few of us have the ability to recognize them for what they are. You, Andrew, are an angel whether you realize it or not. I know all these things because I am a miracle – yes, a living, breathing, walking miracle. I make no secret of it. I just tell everyone I meet, and no one laughs at me. I have given many people comfort in this role. People tell me I’m one of a kind, and I know that to be true. My mother put me in school when I was five and I was forced to leave at 65 – damned cancer. I wish with all my heart I could do what you’re doing. May God watch over you and all you do. If you ever need anything, I’m here to help. God Bless you.